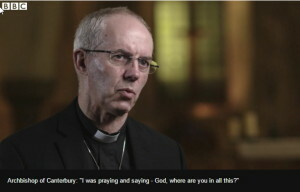 In the article itself this is clarified that the Archbishop was asking God where He was in what had happened. But the video extract in the report itself shows this wasn’t something the Archbishop said but a question he was asked and to which he responded in a deeply personal and reflective way. Arguably the Archbishop’s mistake is answering “yes” to the question before the question was fully asked! This is picked up in other reports such as in the Independent and the Daily Mail. Listening to the actual interview (10 minutes in) reveals a much deeper insight into what the Archbishop was saying as he clearly and openly struggles with coming to terms with the tragedy in Paris. 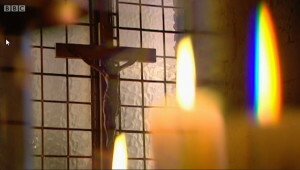 Some people watching this program will be asking the question “Where is God, where is He in all this?” He’s alongside with that deep involvement in the suffering and pain of the world that took Him to the cross. Here he is recognising the reality of what many people will be asking and answering in a caring and deeply pastoral way as he acknowledges that God places himself in the midst of anguish and loss in so many different ways. Does something like this happening ever put a chink in your armour? What answers did He give you? “He said in the middle of it” and also an answer from the Psalms, Psalm 56, “He stores up our tears in a bottle”. None of our sufferings are lost. Hi goes on to speak about the power of religion and how it can be used as a tool by the wicked to twist people into doing what they want them to do. Here we have someone really feeling for those who had suffered so much and seeking to explain how much God cares for and suffers with them. Someone who is prepared to recognise the questions it raises and to seek to respond to them honestly. Someone who was prepared to share something of his own internal journey to get to a place where he could speak positively about God’s presence in the midst of pain and suffering. He isn’t doubting the overall presence of God – rather, he speaks about engaging with God and conversing with Him as he seeks to understand where God was, specifically, in the Paris tragedy. It is interesting that he refers to the Psalms when speaking about his doubts as they are full of people who cry out to God and ask Him what He is doing and why He isn’t acting. So he is drawing on a rich tradition of lament as people engage openly with God while (mainly) retaining complete confidence that God is there. Yes, it was possible to read things into what he was saying but its worth listening to the interview itself and hearing exactly what he did say. And let’s pray for our leaders – both religious and government – as they seek to respond to these awful events in appropriate and compassionate ways. Earlier this morning I was listening to a report on the radio about the work some scientists have done in translating the communications gestures used by chimpanzees – see here for more details. It was an interesting study and provides insight into how this class of great apes communicate using a rudimentary sign language. What I found interesting, and concerning, were the comments made by the reporter and radio host who were discussing the report. They made some statements which don’t seem to be backed up by the science in the report regarding the evolutionary relationship between chimps and humans. They talked about how this study increases our understanding of how human language developed and talked about apes being ancestors of humans. 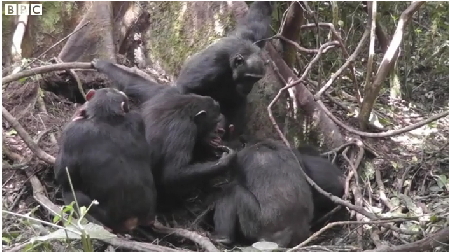 The idea being that because humans are descended from chimps (or at least share common ancestors), understanding how chimps communicate will help us understand how our own languages developed. There is the sense that even though this work is being done to fill some gaps in our understanding of how human language evolved it hasn’t delivered all that was hoped for. But there was none of this nuanced understanding in how it was discussed on the radio. I accept that the media have a difficult job in these areas as they are trying to communicate fairly complicated ideas in just a few minutes to a, generally, non-technical audience and they need to operate within the scientific consensus regarding evolution. But, from a quick look at recent discussions there are questions which the scientific community are grappling with regarding this putative direct link between the great apes and humans. A report in the Los Angeles Times in April last year speaks of evidence which could help solve the “evolutionary ‘missing link'” but it acknowledges that not all scientists share the view expressed in the report. A report in Scientific American in January this year speaks about a “missing genetic link in human evolution” and focuses on genetic material which is believed to play an important role in the brain. It is a fascinating report but one of the things that struck me is the level of honest uncertainty which is expressed by scientists with phrases such as “I think”, “My feeling” and “Much about the duplication process – and its implications – remain a mystery”. They are exploring and studying but recognise that there are still many questions. A report in New Scientist in April this year raises the possibility that one of our “closest long-term relatives may never have existed” due to some confusion over some fossil remains. It is right and proper as part of the scientific process that scientists, in many different fields, should explore and study and critique to try and develop a deeper understanding. 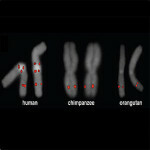 But it is important to recognise, as these reports – along with many others – show, that there are questions about the evolutionary theory regarding humans which haven’t been comprehensively answered and currently divide the scientific community. While the debate continues to rage there, and media correspondents try to present snippets to their audiences, it is good to be reminded that we need to be prepared to dig a little deeper to try and understand what we don’t yet know and to not just accept blanket statements as fact.